You'll have to shed fat to get a V-shape at your waist. A V-shape near the waist is the hallmark of a very toned, low-fat body. Not everyone can get this coveted look, and your body's ability to create a V-shape depends on how quickly you lose fat, how effectively you build muscle and your overall body shape. With lots of hard work, though, you may be able to build a V-shape. Simply toning your muscles won't result in a V-shape, because this fitness achievement is the result of very low body fat in the lower abdominal muscles. According to ScienceDaily, women have between six and 11 percent more body fat than men, and this can make it challenging to shed the fat you need to get a V-shape. It can take months of work and lots of intense exercise, and even then, your body type just might not be right for V-shaped abs. Your diet plays a key role in your ability to get a lean waist and abs because you'll have to eat fewer calories than you burn if you want to shed fat. The obvious choice is to cut out high-calorie foods, especially those that don't provide much nutritional value such as sodas, potato chips and sugary snacks. Boosting your muscle-building power by eating lean proteins such as fish and nuts, and eating several smaller meals each day rather than two or three large ones can help you avoid the misery of hunger. It's easy to get fixated on doing abdominal exercises, but you'll have to shed fat before the muscles that result from your work will be visible. To lose weight, you might need as many as 300 minutes of cardiovascular exercise per week, according to the Mayo Clinic. You'll burn more calories with intense cardiovascular exercise such as running or speed swimming, but for a less intense cardio workout, try water aerobics, walking or dancing. You'll have to target your lower abs to boost your chances of defined muscles forming a V-shape. Try a scissor maneuver. Lie on your back with your legs straight out, then lift your feet about 6 inches off the ground. Spread your feet apart while engaging your abs, then push them back together. Aim for five to 10 reps. Reverse the motion with a roll-up. Lie on your back with your legs extended straight out. Using your abs -- not your back -- roll your body up and your torso off the ground in a sitting position for five to 10 reps. Finally, try a reverse crunch. Lie on your back and bend your knees, then use your abs to lift your hips off of the ground. Slowly lower your legs to the ground using your abs. Repeat five to 10 times. Strengthening your back -- particularly the lower portion -- can help you slim down your waist, and will make most other exercises easier. Lie on your back with your knees bent and feet flat, then grab one knee and pull it to your chest. Switch sides, pulling the other knee up to your chest, then pull both knees up at the same time. Hold for 15 to 30 seconds each time you pull a knee to your chest. Next, try squatting against the wall. Position your back up against the wall, then walk your legs out so your knees are bent as if you are sitting in a chair. Hold for 15 seconds and repeat five to 10 times. 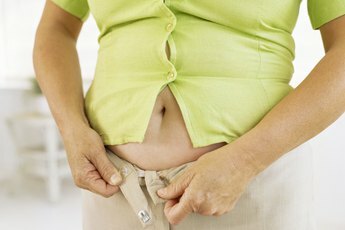 ScienceDaily: Why Do Women Store Fat Differently From Men? Can Doing Squats & Push Ups Every Day Get You a Six Pack?